Pac-Man for iPad is essentially exactly what you expect. It’s the classic tale of two vertical sticks, and the ball that pongs back and forth—sorry, wrong gaming classic. Of course, Pac-Man is the circular yellow dude who chomps on pellets and ghosts. Namco has done a stellar job of porting the essense of the arcade classic to the new platform. Pac-Man is the definitive maze action game. You’re the yellow creature with the appetite for pellets that are distributed throughout the maze. You need to eat all the pellets while dodging ghosts that want to eat you. Four "power pellets" sprinkled throughout the levels grant you invulnerability for a short time, and make it possible for you to eat the coloreful ghosts, who turn blue. Later levels get more challenging due to the ghosts taking less time to turn back to their regular form and respawn. The only thing you need to know to make your iPad/Pac-Man experience complete is that you need to change the default control scheme. The game offers two: A virtual joystick, which is awful, and “swipe” mode, which is excellent. I don’t mean to bias you prematurely. It’s just that the virtual joystick is finicky and not responsive enough, and obviously you can’t feel it under your fingers. In swipe mode, you can slide your finger anywhere on the screen, including on or near the joystick, and move Pac-Man with ease. This is a faithful recreation of the Pac-Man game that’s existed since the early 1980s, complete with Blinky, Pinky, Inky, and Clyde, and it merges nicely with the iPad. Swiping to control the yellow guy feels natural, and the game is a solid iPad citizen: It works in portrait and landscape modes alike, and it resumes your game right where you left off if you get interrupted. 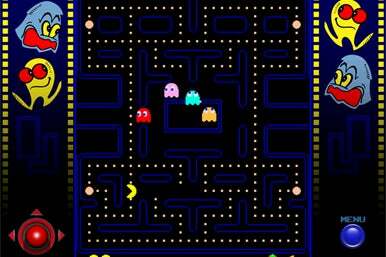 Many players complained that Namco's release of Pac-Man for the iPod featured a screen that was too small. Namco has taken advantage of the iPad’s larger screen to create perhaps the most faithful adaptation of the original arcade experience yet. You know the drill: If you like Pac-Man, you’ll like Pac-Man for the iPad. Gobble pellets, avoid ghosts, eat fruit, and advance through the many mazes to win.